Jacqueline de Jong’s solo exhibition, Harvest, took place in 2000 at the Suzanne Biederberg Gallery, Amsterdam, and Galerie Helmut Leger, Munich. It comprised works De Jong had made following her visit to an exhibition of drawings by Kazimir Malevich at the Stedelijk Museum in 1997. 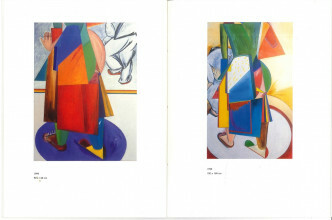 She took the motif of the peasant woman viewed from behind as the basis for cubist-like paintings, two of which can be seen in the “Conversations” gallery of the exhibition Pinball Wizard: The Work and Life of Jacqueline de Jong. 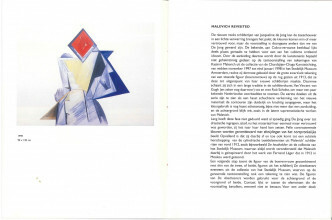 The catalogue of De Jong’s exhibition Harvest, which includes an essay by Geurt Imanse, head curator of the Stedelijk Museum at the time, can be viewed here. 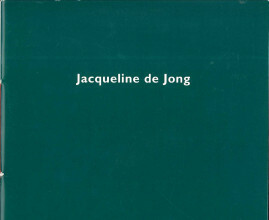 Preview catalogue “Jacqueline de Jong: Harvest,” 2000.